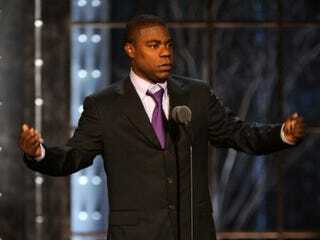 Comedian and actor Tracy Morgan gets a lot of laughs for his 30 Rock performances, but there was nothing funny about his collapse during an awards ceremony at the Sundance Film Festival this weekend. He was attending the Creative Coalition Spotlight Awards in Park City, Utah, where he was being honored with the Spotlight Initiative Award, when he lost consciousness and was rushed to the hospital, ABC News reports. Amy Roberts, a spokeswoman for Utah's Park City Medical Center, confirmed that no drugs or alcohol was found in Tracy's system upon medical evaluation. Morgan, who underwent a kidney transplant in December 2012, co-stars with Jesse Eisenberg and Melissa Leo in the new film Predisposed, which is screening at the film festival.